The regular icosahedron is the unique regular convex polyhedron with 20 (triangular) faces. One of the Platonic solids. 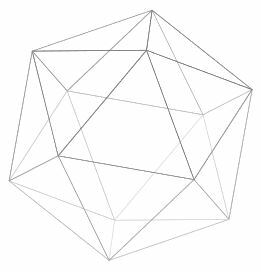 Its symmetry group is called the icosahedral group. Last revised on October 9, 2018 at 08:41:30. See the history of this page for a list of all contributions to it.